Marchmont home, Belleville, Ontario. 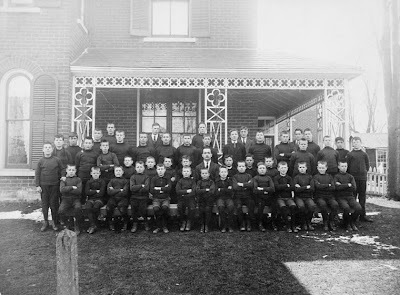 A group of boys from Miss MacPherson's home (London, England). April 1922. Photograph: Canadian Government Motion Picture Bureau, Library and Archives Canada C-034837. Public Domain. Today the Australia government is apologizing to the "forgotten Australians" - those who as children were in government homes between 1930 and 1970. ["Ordeal of Australia's child migrants" by Nick Bryant. It appears that the British government is seriously considering an apology, but that Canada will not, although Canada may be willing to approve some kind of commemoration. Right now, there is a bill in the Canadian Parliament to have 2010 designated as the Year of the British Home Child in Canada which, according to information in the Globe and Mail today, Canada's Immigration Minister Jason Kenney supports and according to Global News, Alykhan Velshi, spokesperson for the Minister, has said the request for a Canadian stamp honouring the home children has been approved. From the 1860s to the 1940s, some 100,000 children were sent as 'child migrants' to Canada. Here they were known as 'home children' - the term used by most researchers in Canada today. Certainly not all were treated badly in Canada, but even those who found new and happy homes, usually lost their connection to family in Britain, or in some cases, even to other family in Canada - siblings were often separated - a loss which many regretted and which their descendants are still working to correct. Since this is a topic of interest to many in Canada and now is in the news, I'm including here a selected list of sources of information and a very selective timeline. The primary research and information website now is the British Home Children Descendants site. My list is not exhaustive, but is meant to get you started if you are interested in this aspect of Canadian history, or if you are descended, or connected, as I am to a 'Canadian home child'. BOOKS – most available at the British Columbia Genealogical Society's Walter Draycott library. New Lives for Old: The Story of Britain’s Child Migrants by Roger Kershaw and Janet Sacks (Kew, Richmond, Surrey, England: The National Archives, 2008). Researching Canada's Home Children by John D Reid (Toronto: Heritage Books, 2005, with the British Isles Family History Society of Greater Ottawa). The Golden Bridge, Young Immigrants To Canada 1833-1939 by Marjorie Kohli (Toronto: Dundurn Press, 2003). The Quarriers Story, One Man's Vision Which Gave Over 40,000 Children a New Life by Anna Magnusson (Toronto: Dundurn Press, 2006). The Little Immigrants: The Orphans Who Came to Canada by Kenneth Bagnell (Toronto: MacMillan of Canada, 1980). The Home Children edited by Phyllis Harrison (Winnipeg, Manitoba: Watson & Dwyer Publishing Ltd., 1979). Barnardo Children in Canada by Gail H. Corbett (Peterborough, Ontario: Woodland Publishing, 1981). “Shipped to Canada” by Janet Sacks, Who Do You Think You Are? July 2008, pp. 26-31. ‘Home Children’ feature, Anglo-Celtic Roots, British Isles Family History Society of Greater Ottawa, Summer 2008. Includes “The BIFHSGO-LAC Home Children Program by John Sayers, “Remembering Brockville’s Scottish Orphans” by Carol Arnett, “Henry Gilchrist: A Quarriers Home Child” by Bryan D. Cook and “John Harold Russell: A Home Child Success” by Joyce C. Fingland. “Finding Dorothy” by Judy Hassall, The British Columbia Genealogist, March 2007, pp. 35-38. “Childhood Lost: The Story of Canada’s Home Children” documentary, directed by Donna Davies. Produced by Cellar Door and Ocean Entertainment, 2004. Shown on Knowledge Network, Sept 2008. Note* Some records may be restricted, for example, to proven direct descendants only. Some research may involve a fee. Barnardo’s - case files, including some for Macpherson and Marchmont children, 1882-1939. Fee for search and copies. Fegan’s Homes - contact Douglas Fry (dvfry@primus.ca ) for an initial search of his Canadian home records database. Nominal fee. Archives of British Columbia – various records of Fairbridge Farm Schools in B.C. for example, administration 1935-1961 – case files of “student trainees”, pages from punishment book (1944-46 Cowichan Station), files of the Fairbridge Alumni Association and the Old Fairbridgian Association (1935-51). Also copies of some federal files. - Maria Rye buys property at Niagara on the Lake. 1869 - Rye brings first group on the ‘Hibernian’ - 100, aged 5 to 11. Marchmont Home at Belleville, Ontario set up. - Father Nugent brings 35 children to Canada – 2 girls are 8; most 10-16. 1872 - Marchmont’s Blair Atholl farm opens at Galt, Ontario. 1872 - First group of Quarrier children to Canada – 64 boys. 1873 - First group of Middlemore children to Canada – 29 children. 1873 - First Stephenson group of children to Canada – 35 boys & 14 girls. 1874 - Local Government Board in Britain appoints Andrew Doyle to report on inspections. Many concerns covered in British papers. 1883 - First group of Barnardo children to Canada – 72 girls – one is four years old. 1884 - Fegan’s first group of childen to Canada – 10 boys, then same year 50 more. 1887 - Barnardo Farm set up at Russell, Manitoba. 1888 - Southwark Catholic Emigration Society opens home in Ottawa, Ontario. 1895 - George Everitt Green, Barnardo boy, found dead in Owen Sound, Ontario, inquest – cause: neglect, starvation, violence. Manslaughter trial – no decision? 1896 - Barnardo Home in Winnipeg, Manitoba opens. 1897 - Ontario passes ‘Act to Regulate the Immigration into Ontario of Certain Classes of Children’ – requires licensing and inspection four times a year. - Catholic Emigration Society opens farm at Makinak, Manitoba. 1903 - Catholic Emigration Association formed – after a fact finding mission and report, sees spiritual, moral and material advantages for child emigrants to Canada. 1915-1920 - No organized child emigration. 1920 - British child emigration resumes – 581 children sent away. 1922 - Empire Settlement Act – Britain and Canada agree to pay $40 towards cost of sending each child overseas. 1924 - Canada – order in council prohibits unaccompanied emigrants under 14. 1935 - Fairbridge Prince of Wales Fairbridge Farm School opens at Cowichan Station, British Columbia. 1938 - Fairbridge Farm at Fintry in B.C.’s Okanagan opens. 1938 - Last? Quarrier group arrives on the ‘Duchess of Bedford’. 1948 - Fintry Farm closes. 1948 - Last ‘Barnardo boy’ arrives by air. 1949 - All Fairbridge farm schools close. There was quite a lot on UK television about the Australian migrants and it was very shocking but also very moving. I do hope there is some sort of apology to the Canadian migrants to give them some sort of recognition for their suffering and, hopefully, some feeling of closure. We've heard very little about the Canadian migrants so perhaps more publicity to the UK might be a good idea. Thank you, Roddy, for your comments. -"Gordon Brown apologises to child migrants sent abroad"